Have you ever heard of a Cavapoo? This curly cutie has been a popular crossbreed for decades now! Small, intelligent, and family-oriented, the Cavapoo is easy to fall in love with. But does cuteness outweigh the health issues this cross inherits? If you are interested in having a Cavapoo join your family,then keep reading, because this article is for you! Where Does the Cavapoo Come From? The Cavapoo is a mix between two incredibly popular purebreds. A cross between the Cavalier King Charles Spaniel (CKC) and the Miniature Poodle, the Cavapoo is beloved for his family-friendly nature, sweet disposition, intelligent mind, and adorable look. The CKC has been a companion dog since at least the 1500s. The Miniature Poodle is also a companion dog, but its larger ancestor was bred for duck hunting! But is this the dog for you? It’s important to remember that the Cavapoo is a crossbreed. While crossbreeding has been going on for centuries now, there is still quite a bit of controversy surrounding the practice. For starters, there are some who argue that crossbreeds are actually just mutts. While others insist that crossbreeds are quite different from mutts, as they have two specifically chosen purebred parent breeds. However, others are more focused on a crossbreed’s health. Are crossbreeds really any healthier than purebred dogs? While it is true that purebred dogs can be prone to a number of genetic health issues due to generations of overbreeding, some argue that they are no less healthy than mixed breeds or mutts. Still, some experts will tell you, yes, crossbreeds can be healthier than purebreds, due to the fact that their gene pool has been widened. Therefore, they have a smaller chance of inheriting certain genetic health defects. Of course, studies are still ongoing and most have concluded that, regardless of whether you have a mutt, a crossbreed, or a purebred dog, all can be susceptible to inheriting the same genetic health issues of their parent breeds. Now, with that being said, let’s talk about some fun stuff. Ready to learn some crazy cute facts about the Cavapoo crossbreed? The Cavapoo boasts an amazing lineage, coming from parents with royal roots, a hard-working history, and even brushes with Hollywood! The CKC is a favorite amongst famous dog owners, including Ronald Reagan, Diane Sawyer, Frank Sinatra, Courtney Cox, and more! And while the Cavalier King Charles has starred in countless television shows and movies over the years, perhaps the most anticipated role for this darling dog is that of the upcoming live-action remake of Disney’s Lady and the Tramp. Of course, the Poodle boasts his fair share of celebrity as well. Famous for his knack at performing, the Poodle is one of the most common breeds chosen for Hollywood films, circus performances, and service work. And with that combination, it’s no surprise that the Cavapoo is a fast-rising star in the canine kingdom. Already, he is coveted for work as a therapy and service animal. When it comes to a crossbreed like the Cavapoo, their appearance depends upon genetics, and which parent breed the cross takes after most. There is huge physical variation among dogs of the same crossbreed, and even among dogs in a single crossbreed litter. Based on the size of his parent breeds, the Cavapoo can stand anywhere from 10 to 15 inches tall and weigh between 10 and 18 pounds. The Poodle and the Cavalier King Charles Spaniel look quite different from one another and have fairly different coats types. For example, the Poodle’s coat is dense and curly. It’s commonly thought of as being hypoallergenic, because it doesn’t shed. However, that’s incorrect – there is no such thing as a hypoallergenic dog. The Cavalier King Charles Spaniel, on the other hand, is a moderate shedder who sheds most during shedding season and whose coat can grow quite long. The Cavapoo crossbreed could inherit his Poodle parent’s tight, curly coat, or he could inherit his Cavalier King Charles Spaniel parent’s luscious, long locks. His look could also vary and be somewhere in between. The Cavapoo’s coloring will also depend on genetics and the colors of his parents. While it is hard to determine the exact temperament of any mixed breed dog, you can get a better idea of what the Cavapoo’s temperament might be like by looking at the temperamental traits of his purebred parents. The Poodle, for starters, is an intelligent and athletic breed who requires plenty of exercise and training to keep him both physically and mentally sound. Poodles are easy to train and eager to please, and they enjoy spending time with their family members. They can become quite attached to their people and make wonderful companions for active families with children of all ages, and they get along wonderfully with other household pets! However, it should be noted that Poodles were bred to be hunting dogs and can have a high prey drive. For this reason, they should not be walked without a leash or harness and should only be allowed outside in a safe and secure environment where they cannot escape to chase after any rogue squirrels or rabbits. The Cavalier King Charles Spaniel is another intelligent and affectionate breed who loves to be with his family and is great for homes with older children and other household pets. Like his Poodle counterpart, the Cavalier King Charles is an athletic dog who is both sweet natured and very playful! He loves to please his family, which makes training simple and fun. Considering the personality traits of his parent breeds, a Cavapoo will likely be affectionate, athletic, sweet natured, and family oriented. He will be an athletic breed who is easy to train, needs plenty of exercise, and requires being walked on a leash. As we’ve learned, training a Cavapoo should be easy, considering the temperaments of his parent breeds. We always recommend positive reinforcement when training any dog, as dogs have an inherent desire to please us and will respond best to praise, treats, and consistency. The good news is that the Cavapoo comes from two rather intelligent purebred parents and is likely going to be a quick study. When it comes to potty training, we should note that sometimes smaller dogs can be a bit more difficult to train, as it is often more difficult to see when and where they have potty accidents. It is important to try and catch accidents when they happen, so you can positively correct and reinforce where your Cavapoo should use the bathroom. Having a schedule with your puppy, crate training, and consistently reinforcing good behavior with treats and praise is a great way to get your pup potty trained. For more help, click here for puppy potty training tips and here for tips on crate training. Along with potty training your Cavapoo, you will also want to make sure you train and socialize him as early as possible. Early socialization and obedience training are key to making sure any dog is happy and mentally sound and will also help to reduce anxiety and aggressive behaviors linked to fear and insecurity. Exercise is also an important part of training any dog. Remember, even the best-trained dogs can begin exhibiting destructive and unwanted behaviors if not properly exercised every day. Since both of his parent breeds are athletic, the Cavapoo should have a nice walk each and every day and plenty of outdoor play time. However, we should note that the Cavalier King Charles Spaniel, in particular, can be prone to brachycephaly due to the structure of his flattened face and skull. If your Cavapoo inherits this condition, then his exercise should be monitored, and he should be watched for breathing issues and overheating. Let’s talk more about brachycephaly and the other health issues a Cavapoo might be prone to. Based on the lifespans of his parent breeds, a Cavapoo puppy can live between 10 and 18 years. Since your Cavapoo is a crossbreed, he can be susceptible to any of the genetic health issues of his parent breeds. As we mentioned briefly above, brachycephaly in dogs can cause mild to serious breathing issues due to the dog’s flattened face and skull structure, along with other issues. Some of the symptoms of brachycephaly include snoring, snorting, difficulty breathing, heat intolerance, lethargy, exercise intolerance, and more. The other major and common health issue CKCs are vulnerable to is syringomyelia. This study found that 25% of one-year-old puppies and 70% of dogs tested over 6 years old had the condition. Syringomyelia is when a dog has pockets of fluid in the spine that cause pain and paralysis. It has a high degree of heritability from one generation to the next. Furthermore, approximately one third of CKCs develop degenerative myelopathy, a progressive hind limb paralysis in older dogs. When looking to get a Cavapoo, it is important to always make sure you go through a reputable source. Remember, responsible breeders will have health-screened their puppies and cleared them for any serious health concerns. You may also opt to have your Cavapoo health tested yourself. Along with exercise and a healthy, balanced diet, you can help ensure the health of your Cavapoo by also maintaining regular grooming practices. The Cavapoo will need to be brushed regularly to keep his coat free of mats and tangles. An occasional bath with a high-quality dog shampoo will keep his coat and skin healthy. Like all dogs, the Cavapoo will need his ears checked regularly and cleaned to keep them free of waxy buildup and avoid ear infections. He will also need his nails trimmed on a consistent basis to keep them from cracking and breaking. Do Cavapoos Make Good Family Dogs? By all accounts, the Cavapoo will make an excellent family dog for families with older children who will handle him gently and respectfully. He is friendly, family-oriented, intelligent, and eager to please. However, due to the seriousness of brachycephaly in the Cavalier King Charles Spaniel, we recommend that you choose a different Poodle cross that is similar. If your heart is set on this cross, rescue an adult Cavapoo whose health issues are more predictable. 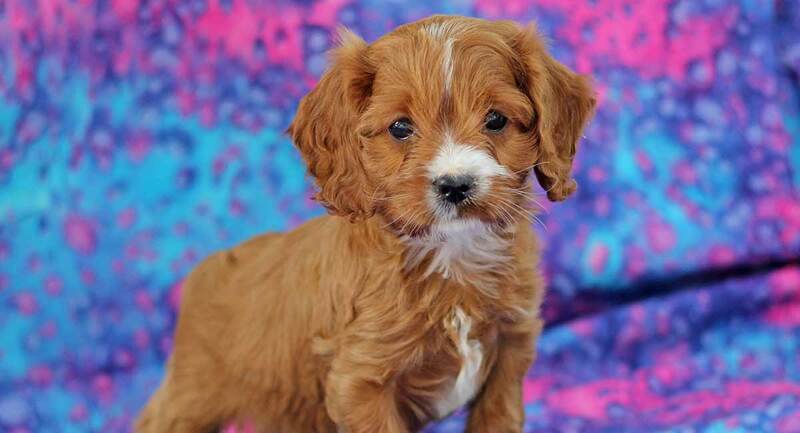 Due to the health issues associated with purebred Cavalier King Charles Spaniel, a prospective owner may opt to adopt a Cavapoo crossbreed from a rescue. Rescuing an adult Cavapoo can help give you a better idea of any special needs or health issues he may or may not have. It also allows you a better understanding of the time and attention these health issues may require. On average, adoption fees are typically between $50 to $350 for a Cavapoo dog. To learn more about how to go about rescuing, visit us here. Crossbreeds are becoming more and more popular. This makes it easier to find breeders of the particular cross you are looking for. Before buying your puppy, we recommend doing plenty of research to make sure you are going through reputable and responsible sources. The great thing about going through a responsible Cavapoo breeder is that they will have health-screened their litters beforehand and be able to offer certificates proving their litters are healthy. Be careful of backyard breeders, puppy mills, pet stores, and online sellers. Stick with breeders who have a good history of breeding and selling healthy puppies. Breeders are almost always going to cost more than going through a rescue or other source, with average Cavapoo breeders charging between $1,000 and $1,800. Puppies require a lot of work and training, especially in the beginning. Dogs are also most expensive in their first year, with owners incurring fees for supplies, vet visits, bedding, toys, and more. Training and early socialization are incredibly important during puppyhood. So try to spend as much time with your Cavapoo puppy as possible and get him acclimated to new places, people, and situations. Remember, positive reinforcement is the best method for quickly and effectively training your Cavapoo pup. Remember, preparation is key to raising a happy and healthy Cavapoo puppy. For a list of what you will need to prepare for a new puppy, visit us here. We love the Cavapoo, but he does come with a number of serious health issues. For a full list of different Cavalier King Charles rescues in the USA, UK, Australia, and Canada, click here. Is a Cavapoo Right for Me? The Cavapoo may be intelligent, friendly, and affectionate. However, this crossbreed can come with a number of serious health issues and will require plenty of attention, especially when it comes to exercise and grooming. We recommend you choose a cross that does not result from a breed plagued with health issues like brachycephaly and syringomyelia, as the CKC Spaniel is. Let us know in the comments below if you have this mix or one of their parents. Borbala Turcsan, Adam Miklosi, Eniko Kubinyi. Owner Perceived Differences Between Mixed-Breed and Purebred Dogs. PLOS One. 2017.